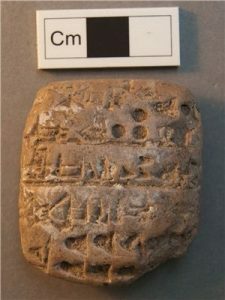 The RAMM collection of cuneiform tablets is a small but varied and interesting group of inscriptions from ancient Iraq. A fragment from King Ashurnasirpal of Assyria’s glorious “Palace without a rival” sits alongside mud bricks from the temples and palaces of other great kings, such as Nebuchadnezzar of Babylon. Administrative texts show the workings of the bureaucracies that ran the world’s first empires, 4000 years ago: records of food and drink for workers, supplies for messengers and offerings for the gods. There are also historic fakes, sold as souvenirs to visitors since early 1800’s. The collection was formed from the smaller, personal collections of several local people. Most come from men who had been stationed in Mesopotamia during the First World War or worked in the new Iraq. It was common for westerners to visit the ancient sites that they had heard so much about: Babylon, where the Jews had been “held captive”, and Ur of the Chaldees, thought to have been home to the prophet Abraham.